(BPT) - Home is all about entertaining - barbecues, parties, pool parties, family dinners and the like. All of a sudden, your kitchen is the nexus of activity as family, friends and neighbors grab drinks from the fridge while you're prepping those burgers and mixing up the fruit salad. Wouldn't it be nice to get a little more space - prep space for you, more chairs for them, more floor space for all the through traffic to the backyard and throughout the house? 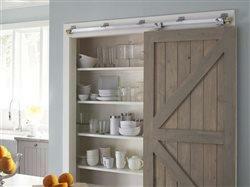 Enter the sliding door, creatively equipped with wall mount door hardware. A wall-mounted sliding door can add up to 14 square feet of floor space, which opens up the kitchen to many different arrangement possibilities, including more prep space, additional tables and chairs for more guests. Sliding doors also provide better flow to the room. When your house is full of kids running around, no one has to worry about a swinging door opening in their face, knocking food or drinks from their hands, or the door slamming from a sudden gust of air. The Johnson 200 WM is a heavy-duty wall mount sliding door hardware that's ideally suited for walls that don't accommodate a pocket door, and can hold any type of door up to 400 lbs. The 200 WM features a thick walled precision extruded aluminum I-beam track and heavy-duty extruded aluminum mounting brackets that can be positioned along the track to anchor into wall studs. Four-wheel ball-bearing hangers assure smooth operation. The 200 WM includes everything you need, including adjustable, detachable door hangers for easy door installation and removal (doors not included). An experienced handyman can complete the installation in about an hour. The jump-proof aluminum box track is available in lengths up to 96' for single doors, and up to 192' for double door configurations. The smooth rolling door hardware and track exceed ANSI standards, which means it can successfully complete 100,000 opening and closing cycles. They are also made in the USA. For more information, visit www.johnsonhardware.com, or call (800) 387-5664. Follow the Company on Twitter: @JohnsonHrdware and Instagram: johnsonhardware.